Supreme dropped its anticipated collaboration with Anti-Hero this morning, after announcing the two were teaming up again earlier this week. Fans of the brands quickly flocked to the online store to cop some of the gear, but as always some weren&apos;t fast enough to get their hands on the goods. So, how long did it take before Supreme&apos;s latest spring drop sold out? Well, all of the most hyped-over pieces were gone in less than two minutes, according to the supremecommunity on Reddit. The group launched a new project earlier this year that tracks the sell out times of the most popular pieces of each release. 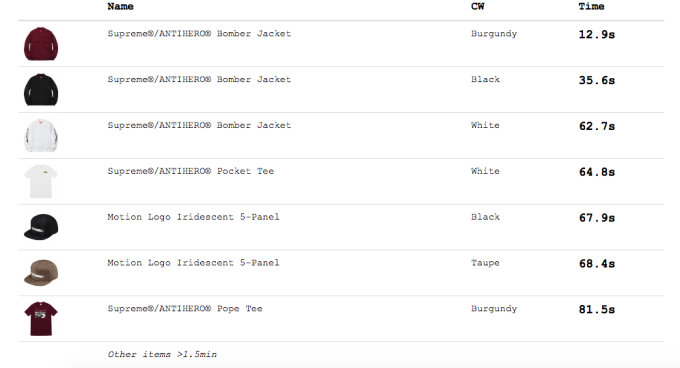 For the latest drop, its numbers show that the Supreme/Anti-hero bomber jackets were the first items to sell out in the US, with the burgundy going the quickest at 12.9 seconds. The Supreme/Anti-hero pocket tee hung around a little longer, but was the next item to go in just 64.8 seconds. The tee was followed by the black and taupe iridescent motion logo hats, which were both gone in 67.9 and 68.4 seconds respectively. The rest of the collection stuck around for at least a minute and a half. It isn&apos;t exactly clear how the supremecommunity determined the numbers, but according to the site the stats are "precise and not always the same you see on the user side." The site also offers other useful information like when the site restocks, prices lists, and what items have yet to be dropped this season. You can check it out here. The supremecommunity did not immediately respond to Complex&apos;s request for comment. Did Supreme Just Reveal a Collab With Anti-Hero in This New Editorial for Japanese Magazine "Popeye"?